Y IS FOR YESTERDAY. By Sue Grafton. Random House Audio. Read by Judy Kaye. 17 hours; 14 CDs. $45. Also available in print from Putnam. You know how in stadiums after the rows of seats have been through the alphabet, the designation starts over with double letters – AA, BB, and so on? 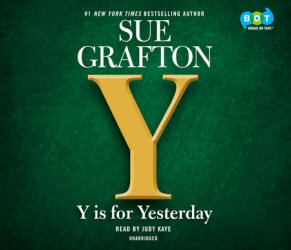 Here’s hoping Sue Grafton will do that when her Kinsey Millhone Alphabet Series mysteries reaches its end, which looms ever closer. After all, with this newest book, Y Is for Yesterday, we’re only one away from the culmination of a series that’s been entertaining readers since 1982. And, as if to make the prospect of the end of the series even more distressing, Grafton has outdone herself with this Y offering. It’s one of the best books in a series that includes lots of very good ones. In Grafton’s fictional world, Kinsey is still doing her detecting work in the 1980s, although we have reached 1989, and the end of the decade, like the end of the alphabet, is nearing. The case she’s hired to investigate is firmly rooted 10 years earlier. Back in 1979, a girl who was a student in the exclusive private school attended by Santa Teresa’s elite teenagers was murdered, and four of her male classmates were implicated. Fritz McCabe, the one who actually shot her, and who received the stiffest punishment, has just been released from California’s youth detention system. One factor in the girl’s murder was believed to have been a cheating scandal at the school; she had been rumored to be the one who told on those involved. But another factor was a videotape the boys had made showing the brutal sexual assault of a freshman girl. Just as a gag, of course, or so they say. Can it be a coincidence that just as Fritz – now a man in his late 20s – is released from prison, a copy of the videotape surfaces, along with a demand for money to keep it out of the hands of the police? His parents hire Kinsey to try to find the blackmailer and make sure their son doesn’t face more legal troubles. The story grows increasingly complex as Grafton moves back and forth between what happened in 1979 and what transpires as Kinsey gradually learns more of the truth about both then and the present. Youthful indiscretions, mistakes, poor judgment or pure evil – whatever happened a decade ago continues to affect the lives of all who were involved: the boys, their victims, the parents. One of the four boys disappeared back in ’79, as soon as their attempts to conceal their roles in the murder began to crumble. Could he have returned? Or could Fritz, still in many ways a spoiled child, be in on the blackmail scheme? With so many of those involved telling lies or incomplete truths, Kinsey faces a daunting challenge. And that’s not all she’s facing. Ned Lowe, the creepy villain from the previous book, X, is back, leaving diabolically clever clues to mess with Kinsey’s mind and trying to harm her and others in more serious ways. Along with the two suspenseful story lines, we have Kinsey as we know and love her, with her eccentric network of friends and associates, some of whom have interesting developments in their lives. Judy Kaye, who has read the audio versions of all Grafton’s Alphabet books, is so convincingly the voice of Kinsey that any other reader would be immediately disregarded. She does a superb job, as usual. This is an outstanding book. Read Y Is for Yesterday, and then hope there will be lots of tomorrows in the world of Kinsey Millhone. This entry was posted in Audio Books, Detective fiction, Mysteries and tagged audiobooks, Kinsey Millhone, Sue Grafton, Y is for Yesterday. Bookmark the permalink. Grafton has a gift for seamlessly drifting between the now and the backstory. So grateful to have this review, as always.